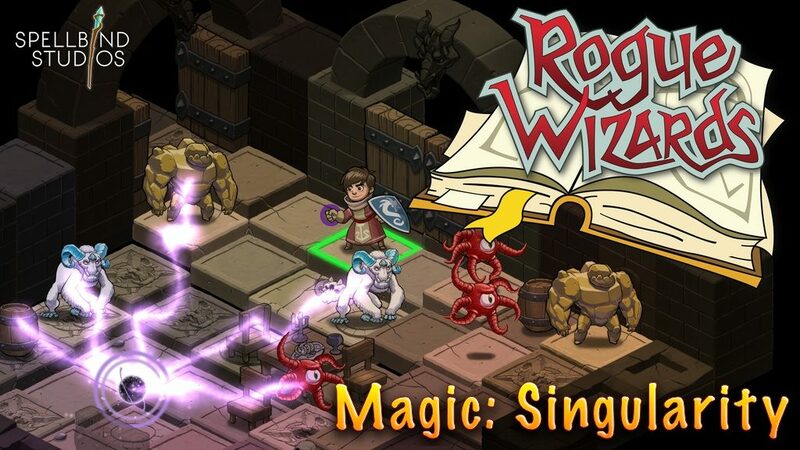 Spellbind Studios, like many other small indie teams, has turned to Kickstarter to bring their vision to life in Rogue Wizards, an isometric 2D spell-’em-up. The “singlularity” magic actually causes the AI to become sentient and start its OWN quirky indie game dev team. Or perhaps I made that up. Talking about an indie studio churning out a roguelike RPG game is like talking about a politician lying: it’s expected, it’s nothing new, and is it really something we have to hear about? In the case of Rogue Wizards, why not? For one thing, while the game does share many of the elements of the typical roguelike — procedurally generated dungeons, turn-based combat and gameplay, and so forth — it wraps it up in a fun, quirky isometric art style that gives it a bit of visual bang. Unlike most other games of the genre, you are also not limited to just one randomly generated dungeon: instead, you have a hub town from which you can visit different dungeons as your character grows stronger, and even upgrade and improve the town as your funds and influences increase. So, I guess kind of like a 2D Dark Cloud for the PC, Mac, iOS, and Android markets. And how can you complain about that? The team at Spellbind Studios are proud of their little project, and are most notably proud of the positive response other industry professionals, including members of the teams behind Diablo, Torchlight, and Nox, have had to their game. Looking at those titles listed you can see that Rogue Wizards is aiming for more than just a roguelike feel: its a roguelike that wishes it were an action RPG. The singularity spell shown above — which actually deforms the terrain and harms beasties within its reach — is only the latest of many spells the team has created for the game. There are six schools of magic, each with their own unique hierarchy of learnable spells. Combined with the game’s randomized features and the player’s freedom in terms of character capabilities and world design, and you have a game that is aiming for massive replayability. Rogue Wizards’ kickstarter will be running for just under a month more, so be sure to check it out if the game interests you, or if you’re too strapped for cash for a Kickstarter backing then you can always just vote for Rogue Wizards over on its Steam Greenlight page.